Recently I had the opportunity to do a job swap with one of the guys in the laboratory here at HSL. I helped out with the mass-spectrometry and James helped me with the data analysis. Two very useful things came out of this. Firstly, it’s been very informative to see how the data I get is created. I tend to assume that the numbers that are given to me are either correct or mistakes. The reality though is more subtle. One thing at surprised me was the length that the chemists have to go to to make sure that their instruments give sensible answers. As well as testing urine samples, you need to test blank samples (to clean out the spectrometer’s tubes), standard samples (to calibrate the machine) and quality control samples (to check that the calibration is correct). Even then, it wasn’t entirely clear that you would get the same answer if you ran the samples twice. The project was based around testing Thallium levels in the general population. 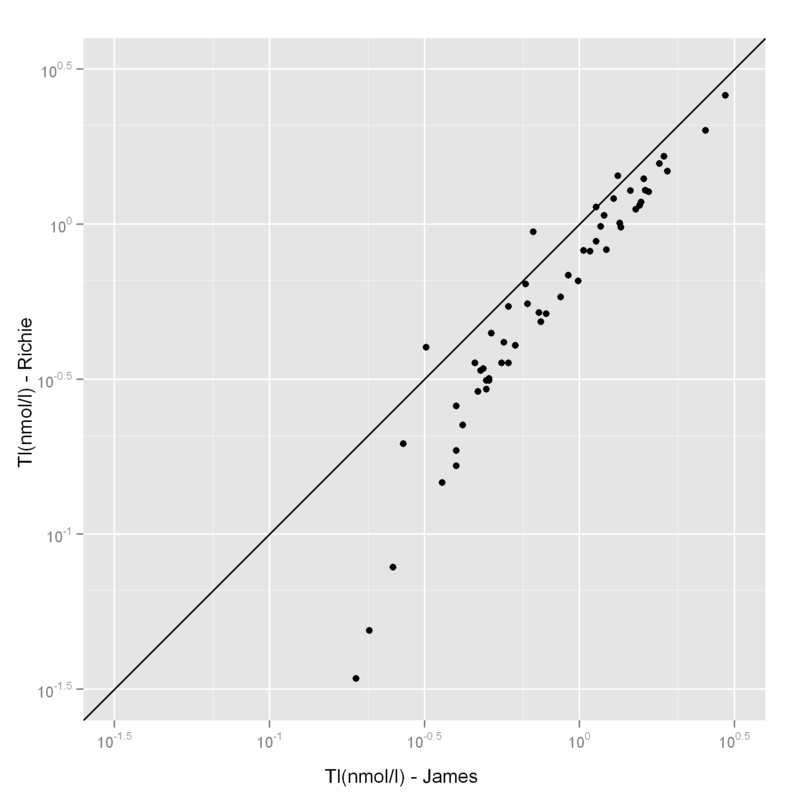 To give an idea of how much we could trust the data, I re-analysed 50 of the samples that James had run. The tricky bit was the pipetting; there’s a surprising art to avoiding air bubbles. I come from the Pharmaceutical R&D industry, where each assay has to be ‘validated’, which involves specific tests to define how accurate and precise it is, and under what conditions those numbers might change. For your example I would expect the Lab person to be able to say ‘within this range of concentrations, your result is accurate to +/- x% tot he ‘true’ value, and I would expect it to vary with approx y% coefficient of variation. The statistician (or anyone using that data should totaly be aware of those numbers, otherwise he’s just turning garbage into garbage.